A few days ago Sarah Mckendry posted a YouTube video of her cabin for sale. The moment we saw it our knees buckled, for we think this is the kind of property which is quintessentially Canadian. The setting is bucolic, the vernacular timeless, and it does nothing less than beckon us. 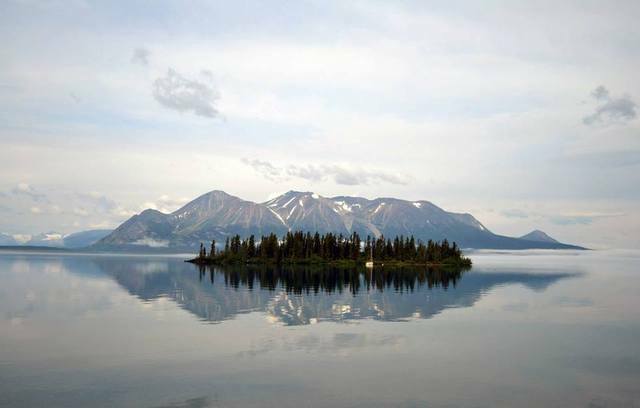 On the northwest tip of beautiful British Columbia is a small community called Atlin. It is the dream spot for adventure seekers and nature lovers alike, and within the heart of it's tiny village is a gorgeous log home that is currently for sale. Consisting of three bedrooms, one bathroom, and a spectacular open concept floor plan, this is the perfect getaway for those looking for a break from the city life. Located one block up from the pristine glacier fed Atlin Lake, the views are breathtaking from each floor, and even though the house is in the center of the small village, the northern lights are always visible when the skies are clear. Atlin is an unincorporated community, meaning that there is no local government. The community is run by a dedicated and wonderful group of volunteers who go above and beyond to make their village safe, welcoming, and accessible. Even though the year round population is only in the hundreds, the local shops and businesses provide absolutely everything that is needed to live comfortably on. Atlin is also only one and a half hours south of Whitehorse, Yukon. Every season is spectacular when you are in the north. In the summer, the Atlin Art and Music Festival brings thousands of people from all over the globe to it's center, and it has become world renowned for it's lineups and amazing atmosphere. Summer, spring and fall boast incredible fishing, hiking, kayaking, boating, horse back riding, and biking and in the winter the heli-skiing, back country treks, sledding, snowshoeing and back country skiing are some of the best that the world has to offer. The wilderness is untouched for hundreds of miles in each direction, and the opportunities for adventure are absolutely endless. This incredible home in this incredible setting is on the market for $225,000.00 CAD. Please contact Sarah at atlindreamhome@gmail.com for more information. Do you know someone who would love to make this Home? Please share!